I am still decompressing from conference mode and have several things in the works for you all that I’m very excited to share! But I’ve been seeing this phenomenon on Facebook and elsewhere in wake of a certain awful bill passing in North CarolinaÂ which made it illegal for trans folks to use the right bathroom. While they were at it, they also stopped cities from being able to raise mandatory minimum wage and perhaps extra bizarrely, got rid of discrimination protection for veterans (aren’t conservatives allÂ aboutÂ their military?) Lots of people have picked this law apart and pointed out that it’s the worst (and it is), but there’s something else I want to touch on right now, and it looks a little something like this. But if you’ll walk with me a minute, I’ll explain. I don’t know any of the people in those photos, so I mean, I don’t know what they think about it. But were any of these lovely folksÂ askedÂ if they wanted to become the face of the bathroom movement? 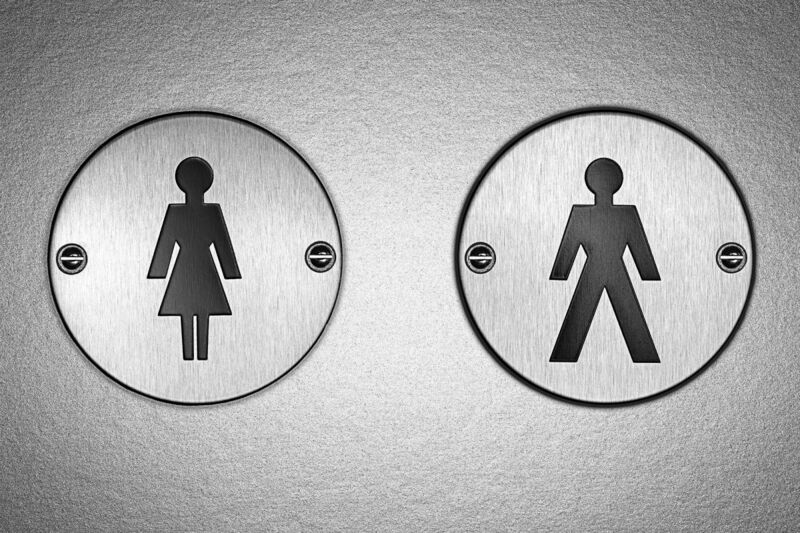 And, perhaps a little more to the point–is the safe bathrooms movement really for them? Again, I don’t know these folks! I don’t know their stories! 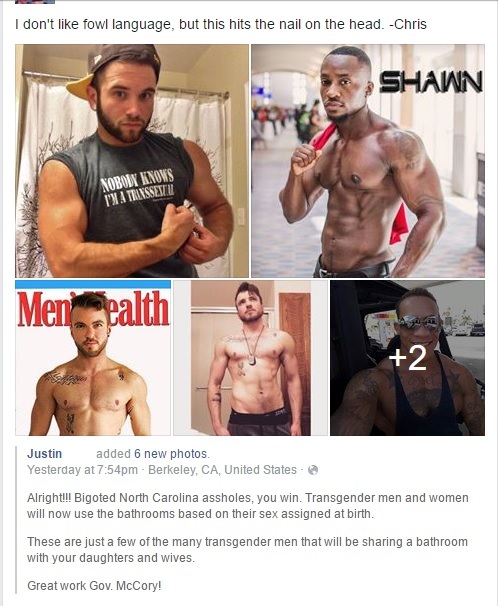 But if the point of a post like this is something along the lines of “you can’t tell when people are trans”, which, let’s be clear,Â you can’t,Â but me remind you thatÂ bathroom safety should not be limited to people who can safely pass. I’ve written here before and I’m sure I’ll write again that I don’t “pass” as anything. And I mean, I shouldn’t, because I’m not a dudeÂ orÂ a lady, so public washrooms are kind of always a minefield for me. But especially because of that,Â bathroom legislation is a big deal for me.Â Because there is no “right” bathroom for me–unless we’re in one of those cute little family restaurants that just has the one room with a lock, because then it doesn’t matter. But at school, at Starbucks, in the mall, at the airport–none of these bathrooms are “right” for me, and certainly none of them are comfortable. At best, I get ignored. On average, I get judge-y or nervous looks from strangers. Infrequently, I’ve been asked if I was in the right place (or perhapsÂ toldÂ quite clearly that I was definitely in the wrong one). The worst time, I got called several slurs and probably would’ve gotten hit in the stomach if I hadn’t gotten the hell out of the bathroom before the Bathroom Avenger got across the room to show me what for. And I’m certain that my stories are just the beginning of the fear trans people face about using bathrooms in public. I wouldn’t be surprised if we had a higher rate of UTIs from holding our bladders until we got home. North Carolina isn’t an isolated incident. Kansas is currently trying to pass a bill to make it legal for students to actuallyÂ sueÂ their universities for $2,500 for the inconvenience of running into a presumed-trans person trying to pee. (Hey man, I’ve got a solution, just pay me the $2,500 a month to pee at home and we’ll be golden!Â Or does someone wanna go in on this to sue universities and split the payout? I’ve got lots of student debt to pay….) South Dakota just tried to do the same kind of bill, and so did Tennessee. North of the American border, Canada just had a hell of time striking down its own bathroom bill after the Conservative party got a hold of it. The “predatory threat” to cis people in bathrooms is a myth. There’s not a single case of a trans person assaulting anyone in a public bathroom. And studies on sexual assault show that the vast majority–82% of cases–are committed by someone known to the victim. Fifty percent of cases occur at home, or within a mile of home. And let’s be real–if someone, regardless of their gender identity, really wanted to sneak into a bathroom to assault someone, you really think that a little sign on the door with a stick person in a dress or in pants is going to stop them from doing that? So who’s really at risk here? It’s not cis people. And you know what? I would go so far as to argue it’s not those buff guys up there, nor beautiful badasses like Brae Carnes who started the “#WeJustNeedtoPee” movement. And I’m not critiquing those folks here–I’m grateful for their solidarity! Â But please be careful in how you frame this debate (I can’t believe it even needs to be a debate, but that’s another blog post). Non-binary folks and non-passing binary trans folk need to pee too. Please don’t makeÂ us invisible–we’re the folks who need this protection the most. If this post taught you something, why not leave a tip?Â Being an unemployed queer kid is tough, and your support really makes a difference. Likes and shares help the blog grow as well! For the military, conservatives advocate using soldiers for military intervention, but not providing them social supports or any kind of personal help. That throws people like you and me under the bus. For me, I do look like those men passing for cis, and I do belong in the women’s washroom. Trans activists are suggesting I don’t belong in the women’s washroom based on my looks? That hurts more than cis people doing it, because these guys should know better.